The Edgar Award-winning series featuring Atlanta P.I. Sunny Childs continues with a tale of dinner-hour death. A gun-toting teen holding up the Blind Pig Diner takes Sunny and other diners hostage, but claims his innocence in the murder of a woman whose body lies on the diner’s floor. It’s up to Sunny to investigate what looks like a clean-cut case of murder before time runs out. 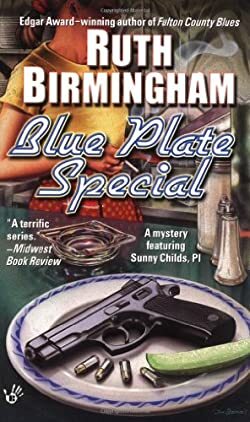 Atlanta private detective Sunny Childs finds herself held hostage by a gun-toting teenager, who claims to be innocent of a clear-cut case of murder and who wants to prove it before he will let Sunny or any of the other hostages leave the Blind Pig Diner. By the author of Fulton County Blues. Sunny is back once again taking a case for the private investigation agency she is employed at. This time, we have a hostage situation where Sunny is directly involved. It is now up to her not only to get them out of their predicament but also to solve the mystery of the murdered woman. Because, the teen who keeps them all hostage says he didn’t do it.